How can 3D models and augmented reality visualization based on mobile platforms enhance the value of urban heritage? This paper was chosen among numerous papers that constituted the program of the FIG Commission 3 workshop in November 2017 in Lisbon. The main idea of the Paper is about Digital Representations in the relation between Technology, Agents and Several Knowledge Domains, and is aimed at analyzing the Augmented Valuation of Cultural Heritage based on Geographic Information Technologies (GIT). The built heritage is a fundamental element of the public space. It is part of the memory of places; it is the history of places represented materially and often-beautiful iconic city landmark. For these reasons, among others, cities that preserve this built heritage with intrinsic rare value are highly pursued by the tourism industry, because they constitute financial profit and economic growth. These sources of income are frequently a factor in balancing public finances and support this urban inherency. Today, the diversity of mobile platforms providing access onsite to real-time geographic information and the possibility of supporting Apps based on Augmented Reality enable, what we can call, the expansion of public space and their cultural heritage value. The Apps can be understood as dematerialized extension of the public space and their cultural/historical value. The recreation of the public space with heritage value (physical and limited) gives place to the virtual/mixed public space, leading to what we can call smart public space (an intergenerational interaction in the combination of paper maps or other objects, with unlimited virtual information, supported on mobile platforms) and as a consequence increases also the "ubiquity of cities". The development of 3D models of urban objects implanted in public space, using land surveys and UAV, and its incorporation in Apps for the conceptualization of mixed reality environments, enhance the value of urban heritage and promote the virtualization of cities. This idea will support the demonstration of the prototype Lx_W App, developed for the Águas Livres Aqueduct System in Lisbon, aqueduct that is one of the most important landmarks of the Portuguese capital. The Smart City concept fills many of today's discourses on cities. This concept is closely associated with Information and Communication Technologies, although it is not exclusive. In fact, the concepts of city efficiency, of intelligent cities, of strategic governance capacity, among other concepts, are present in the discourses that we can call non-technological discourses. In this circumstance, we can admit that we are in the presence of political discourses. In any case, whether it is technological or political speeches, what is relevant in our opinion is that the concept of Smart City is insufficient, as Carlo Ratti (2014) refer in a popular article, "The Smart City is not enough. How could real-time data awaken the humanity in our buildings and public spaces?". 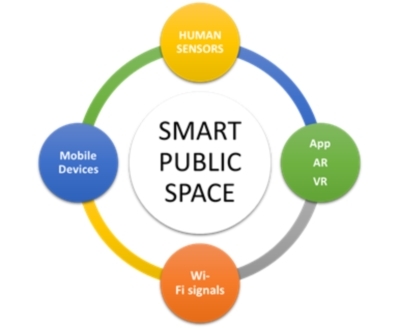 Within this context and considering the way we see the relations between the city and the technology, we propose the following idea alignment: what exists is a Smart Public Space that results from the combination of "Human Sensors (HS) + Technology (Tech)" (Figure 1). There is a Smart Public Space when there is a combination of HS + Tech. HS are in physical, tangible, sensitive interaction with real space. Hence an internal representation of this real space. Using Tech (mobile devices, Apps, AR, VR, Wi-Fi signals) the HS enrich these internal representations of public space, itself enhanced by enrichment with virtual data. In this context, we can admit that there is a Smart Public Space when there is convergence between the physical public space and the virtual public space resulting from the HS + Tech interface. Built heritage and memory of places. The built heritage is a space of memory; memory in overlapping, as if structured in layers (due to the passage of time) and in fusion (for example, of architectural styles, forms, methods and construction materials). All built heritage has a narrative, synthesizes collectively shared representations. Many of these representations remain in time, they are part of the cities and the public space that compose them; are historically appropriate identity and identification references. It is often said that "every stone speaks" when we observe a building with patrimonial value. We can affirm that the "whole" of a historical building contains a narrative that can be enriched with information inherited (architectural description, engravings, photos, ambiences, etc.) structured on mobile platforms. Built heritage and public space. Buildings with historical value, as well as all other buildings, are part of the architectural composition of the city and of the places in general. In this context, the city is understood as an open landscape constituted by three-dimensional pieces in an organized environment of which the open spaces are part. Many of these open spaces are public: squares, farmer's markets, downtown shopping malls, public parks, playgrounds, greenways, waterfronts, etc. This public space is the place of sociability manifestations such as walking, talking, studying, shopping, interacting with others. The built heritage is a fundamental element of the public space. On the one hand, as we have mentioned, it is part of the memory of places; on the other hand, constitutes a dimension of the history of the places represented materially. For these reasons, among others, cities with rare built heritage are highly valued by the tourism industry because they are sources of financial income. These sources of profit are often a factor in balancing public finances. Built Heritage and Augmented Reality. The decade of nineties of the 20th century were marked by the emergence of Virtual Reality. The second decade of this century lives the Augmented Reality. The overlay in "synchronous time" of virtual images with elements of tangible reality is becoming an unprecedented social, cultural and tourist practice. Today, the diversity of mobile platforms providing access to real-time geographic information (synchronization) and the ability to support Apps (understood as data and technology that supports space-time extension) built on Augmented Reality enable what we can call of expansion of the public space with patrimonial or other value; ease the synchronization between physical public space and virtual public space. Again, we emphasize that Apps can be understood as the dematerialized extension of the public space with patrimonial value. The recreation of the public space with patrimonial value (physical and limited) also gives place to the virtual public space and leads to what we can call smart public space. In the context we have just presented, we propose a new concept: Augmented Valuation of Cultural Heritage, as a result of virtual georeferenced data added to the real world applied to cultural heritage using mobile technology (Figure 2). This concept is outlined in the figure 2 and is composed of three fundamental parts: i) the tangible cultural heritage; ii) the intangible cultural heritage; both being part of the cultural heritage; and iii) the augmented valuation results from the combined use of virtual data and mobile platforms. This combined use increases the value that the built heritage has. It extends the memory and qualities of this heritage; increases its value because it introduces the possibility of constructing a narrative. In what way can we answer the question: "How can 3D models and augmented reality visualization based on mobile platforms enhance the value of urban heritage?". Presently, we use of public space resorting to mobile platforms has been a reality for some years. In such a way that the urbanism of the future will consider this new reality. There is no better way to answer the question, nor to exemplify what we have just said, than to resort to the short story of implementing a mobile App. Urban planning is intimately connoted with spatial relationships between objects, buildings, blocks, streets, neighbourhoods, and cities, and often 2D representations are considered insufficient to address real 3D planning problems, especially at the scale (in area and height) of the modern city (Yin, 2010). 3D representations increase the engagement of the user, making easier to understand and participate by visualizing interactively, for example, volumes, textures, shadows, sights and their relation. This principally occurs because of its high level of similarity to reality and how humans perceive the world, congregating detailed information and volume property, stimulating more enthusiasm and simplifying creative solutions for detected problems after a walk-drive-fly-through re-presentation (embodying the user in that environment or presence), improving understanding and communication. 3D representations and analysis tools are more adequate for volume variation and enriching spatial representations. Allowing to collect data to generate diverse types of geographical information products, and particularly very detailed 3D point clouds and models, practically on demand, Unmanned Aerial Vehicles (UAV) has introduced a flexible, low-cost and rapid response as an alternative to other traditional methods, such as ground acquisitions and manned vehicles. 3D point cloud data automatically generate 3D models, including Digital Terrain Models (DTM - simple terrain), Digital Surface Models (DSM - including the elevations of objects above the ground), and 3D models (from isolated or collective objects). 3D point clouds are mostly generated directly from a laser scan or through stereo image matching, processing imagery algorithms by overlapping (terrestrial or airborne). This means that it is possible to acquire relevant urban parameters at low-cost, from 3D point cloud data acquisition (Tenedório et al., 2014). Unlike Virtual Reality, which provides a synthetic environment as a replacement for (represented) reality to the user, Augmented Reality, ensures that the user sees the real/virtual environment augmented and mixed with information from the opposite environment. Thus, the frontier between virtual and real worlds may be more diffuse and permeable than experts had previously imagined. This Mixed Reality complements reality/virtuality rather than completely replacing it, appearing to the user that the virtual and real coexist in the same space. This technology is becoming increasingly popular at overcoming numerous issues, such as the obstacles related with the successful public participation, regarding, for example, flexible solutions adapted to different scenarios that may arise (e.g. public consultation meetings). Augmented Reality as a tool has the potential to assist decisional processes in the context of urban design and planning, adding the capability to increase representational information (virtual or real) into the selected environment presented (also virtual or real). These characteristics are also valid to understand temporal and spatial changes, manipulate geographical data and navigate through this alternative space. Techniques like image matching and the use of a navigational coordinate system allows linking virtual data to the real environment (the device knows where the user is) as a camera permits capturing real images and mixing them with virtual synthetized digital representations, visualizing in real time in the device screen.nbsp; 3D virtual representations of objects allow us to model and (virtual) travel through time, creating new methods of special analysis and visualization as we perceive them in our heads (e.g. internal representations or imagination). Through technology, both the virtual and the real worlds can be combined expanding the space/time dimensions, human connectivity, and information/intelligence, expanding the mind. Augmented Reality enhances the real world instead of replacing it. The users can view the real world enriched with additional 3D graphics superimposed to their field of view. The possibility of combining real and virtual objects will allow a huge amount of applications. In the field of Cultural Heritage, AR is of the most outstanding technologies, considering the possibilities to recreate 3D representations, to Virtual Time Travel (fundamental for cultural elements that are often historically relevant), and combine the virtual with the real world (e.g. recreate some object from the past or viewing several phases of construction). This is more valuable when using mobile devices since these are portable and can be used on site, knowing the user’s position through navigation systems. AR digital representations, restitutions and simulations can offer interesting possibilities and useful applications, due to their fairly good interactive capabilities and their capacity to visually stimulate and engage the user, for example, when applied to cultural heritage on-site visualization and exploration tools. 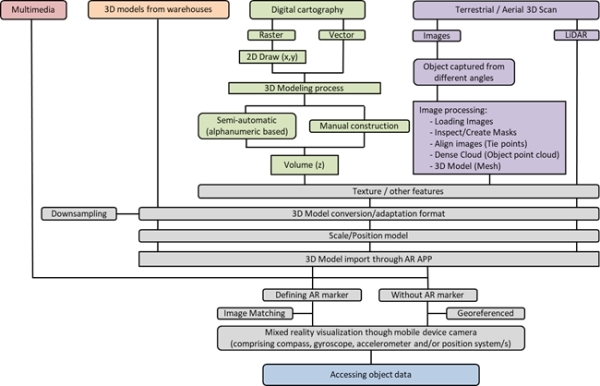 The figure 3 schematically synthesises the methodology, procedures and fluxes of data used in the case study developed, concerning the visualization of 3D models, gathered (internet catalogues) or produced, using 3D modelling software or 3D scanning (terrestrial or aerial - UAV) to be visualised in an AR environment. Considering the fluxes of data, simple multimedia images/videos might be visualised within mixed reality environments through mobile platforms. In the case of built 3D models (e.g. internet catalogues), it may be necessary to convert or adapt these to other formats, compatible with the AR application to be used in the mobile device. Based on digital cartography, in the case of the 2D vector, the volume associated with alphanumerical “z” values can been created (beside the z value, in the case of a building having, for example, the number of floors, the user can assign a medium height and multiply to calculate an estimation of the building’s volume), while on raster documents (e.g. satellite imagery or ancient cartography) the process requires 2D/3D drawing and eventually adding texture (e.g. building façades) or other features (e.g. audio or video) (Marques et. al., 2016). A 3D scan can be made using several techniques, geomatics, sensors and terrestrial or aerial platforms, taking into consideration scale and object availability. The UAV become extremely relevant considering fast data acquisition based on low cost platforms (when compared with traditional methods). Photogrammetric applications and point cloud extraction by image-matching overlapped images generates rapid data acquisition and processing results. LiDAR might be applied to collect three dimensional point clouds of cities and buildings. High levels of detail and considering large amounts of data retrieved in the models produced, it is frequently necessary to convert, filter and down sample these to further improve the performance of the model, especially in mobile platforms (considering the graphics and processor capacity). The models produced required some adjustments regarding graphic correction, scale and positioning. Once the 3D model has been imported to the AR application, a marker can be defined through image matching recognition (e.g. satellite imagery, ancient map or a touristic map, as in previously to examples) or visualised over a certain chosen surface. However, in the case of not using AR markers, the visualisation in the field may be associated with real coordinates (a georeferenced 3D model) and eventually enable the possibility to access more information about the object. The “Águas Livres” Aqueduct System was projected as one of the boldest hydraulic engineering structures built in Portugal, crossing the municipalities of Loures, Sintra, Amadora, and Lisbon. The works for the construction of this complex system were initiated in the 18th century. Built in limestone, the Águas Livres Aqueduct System, which has been deactivated for 50 years, is presently an important historical and cultural heritage landmark in Lisbon. The Lisbon aqueduct collected, transported, accumulated, and distributed water by gravity (with a descent of ~3mm/m); it included the general aqueduct (14km), the subsidiary extensions, reservoirs, underground galleries and fountains, which in total extended for a length of approximately 58km. The aqueduct was classified as a National Monument in 1910 and its most remarkable section is located in the Alcântara Valley. The existence of this structure in the city is not obvious, especially because it is not visible (it is mostly underground), although it has contributed to define in part the evolution of the territory (with regard to water supply, but especially considering the impact of the implementation of the aqueduct system). The use of technology applied to cultural heritage has enormous advantages to better visualise and understand the importance of such elements, recognising the connection between the structural elements (visible) and areas (known by its path). In view of the importance of the Lisbon Aqueduct monument, research was undertaken for the elaboration of a mobile device App (Android) that enables the visualisation of the GIS information and 3D modelling in the AR environment on site. The GIS data collected and project, consisted in the georeferencing of several sets of ancient cartography contemporaneous to the LAS (to identify and vectorise the entire system and associated elements: Reservoirs, fountains, vents, etc.) and several other datasets, (such as terrain, water lines, roads, building) supported the system comprehension and identification. Example of that is the Digital Terrain Model, which helped to better comprehend the water distribution through gravity and the system galleries and aqueducts. The identification of the Lisbon Aqueduct System structure and associated elements within the GIS project, produced new georeferenced datasets, consisting mainly in segments and dots (X, Y). The several sets of ancient cartography used (from the years 1856, 1858, 1868, 1968), required procedural processes of scanning, colour and geometry correction and built mosaics of parts of charts. The cartography, during the procedure of georeferencing, reveal to be highly accurate being extremely useful for the identification of much of the path of the main aqueduct, adductors, distribution galleries and associated elements, enabling the delimitation of traces on the territory, as well as missing objects, displaced or projected but never executed. There are several internet catalogues and warehouses with 3D models available to use. Besides that, the creation of 3D models could be carried out with common software (e.g. 3D Studio Max, Blender, Sketchup, or City Engine), with a high level of detail and without losing performance while inserting them into the augmented reality application. However, the use of a survey point cloud based on a collection of fieldwork photographs proved to be surprising, taking into account its rapid acquisition and processing capabilities with the additional advantage of being authentic. The processing stages of the workflow, besides being very organised and intuitive for the user, allow for the adjustment of several specific tasks and adequate different types and sources of data (multiple scales, objects, environments and/or using different devices and techniques). The software generates 3D models extremely quickly, with regard to the procedures of inserting and aligning photos, and building dense clouds, meshes and textures (with a wide variety of output formats), as refered already in the Figure 3, image processing from terrestrial/aerial scan (Figure 5). However, the technical challenge is to simplify these 3D models (with the elimination of faces for example) without losing the realism of urban elements. With the 3D modelling software (Agisoft Photoscan), it is possible to draw masks in the pictures taken to reduce the area of the image that the software has to process, identifying common pixels. The position of the pictures (cameras) made by the software (alignment) is commonly amazingly accurate and very near the reality. During the modelling process, it is possible to eliminate data that could introduce unnecessary noise to the final result. The parameters used depend on computer capacity and final results objective, considering the limited resources of the current most commonly used mobile devices. The Águas Lives aqueduct system has several elements that permit the collection of data by using simply terrestrial images (on site) and creating point cloud meshes. Otherwise, considering the dimension and volume of objects such as “Mãe de Água das Amoreiras” (37x33m com 17m height building), it is very difficult to conduct a survey without using high or aerial platforms. After having all the authorisations and subsequently performing the necessary flight tests and security, it was decided to use UAV to collect data for the “Mãe de Água” water reservoir. Thus, the usage of a UAV greatly simplifies the assignment of collecting data and processing them, although these data are authentic with an impressive level of detail. In the technical-scientific field, there is a growing interest among technicians for the usage of 3D virtual models, taking advantage of their enormous potential for pedagogical, documentary, and exploratory activities, as well as of their predictive power. This is especially relevant for urban studies since it facilitates interventions in historical sites, rehabilitation and planning of buildings, neighbourhoods and cities, providing opportunities to simulate past, present, or future interventions, and their respective evolution and management, where people can move through and interact with the space within a virtual/mixed environment. This emergent interest is associated with the very fast process of urban sprawl, also tied with the tendency of cities to growth in terms of height (Z axis) and consequently elevating the level of complexity of the urban processes that take place in the third dimension. Mixed Reality environments have the potential to assist decisional processes in the context of urban and environmental planning, cultural and natural heritage modelling, adding the capability to increase (virtual or real) representational information to the selected environment presented (also virtual or real). Realistic 3D environments offer the user interesting possibilities of immersing in/combining with the real world, e.g. convincing reconstructions of events and contexts particularly to raise historical awareness. Virtual environments and especially Augmented Reality have, thus, a clear potential to support cultural heritage, highlighting and enriching its value in a dynamically and interactive form. It also allows users, especially the general public, to learn, intervene, and experience with higher engagement innovative approaches to the promotion, operation, and dissemination of cultural heritage. The research about the development of one mobile App to visualise the LAS within an Augmented Reality (AR) environment developed several tests consisting in the use of the mobile device camera to visualise the elements of the LAS in virtual data over the real environment. Using the segments and dots of the structure collected previously was possible to understand, in place, the location of the structure and the azimuth of any other element of this monument and the respective distance (from the place of the user and using the device position system – GNSS). However, the most interesting capability revealed to be the possibility to enrich a free and accessible city official plan in paper, with virtual sets of 2D/3D produced data within an AR environment. To accomplish that, it was developed the mobile App Lx_W (Lisbon Water), which was divided in two main Apps, consisting in the AR component: AqueductAR; and the LAS contents: AqueductGPS (ancient and actual pictures, texts, possibility to visit, costs of entrance, google map thematic representation, proximity alert and navigation). 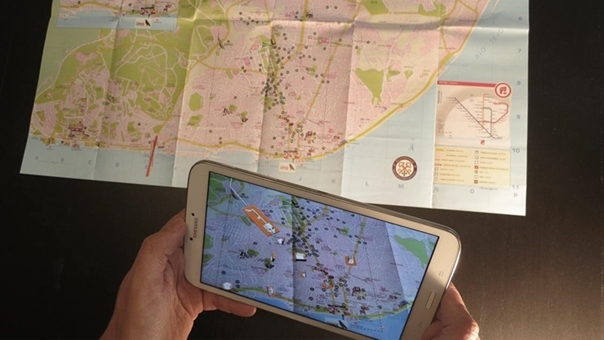 The Lx_W App was developed having in mind the idea of using the paper city plan (Official Lisbon Plan), extremely accessible and available for free, as a AR marker (Marques et. al., 2017). 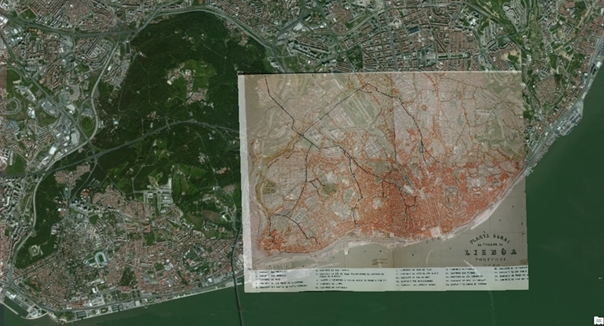 The combination between the paper maps (analogue) with the digital virtual data at 3D/4D, superimposed within an Augmented Reality environment is a very interesting capability that might be useful to endless applications (for example, in this project, it was though to use as case study the ancient Fernandina Wall or the Lisbon 3D recreation before the 1755 Lisbon earthquake). The limited base information printed in paper can in this way support innumerous datasets of geographical information, transforming this simple paper map into any thematic cartography required by the user and properly developed. This idea has several exciting approaches while thinking in: the combined intergenerational use (between the older people preferring the paper and younger generation visualising the virtual data through the mobile device); or the portable unfindable thematic proposes; higher number of possibilities for visitors exploration (e.g. touristic/visitor paths with monuments/restaurants/university campus highlighted in 3D visualisation); new forms of sites and brands promotion or publicity; support for navigation; alerting for proximity of objects; among others. Superimposing the representation of the LAS structure over the Lisbon Official Plan, the users are able to simply open the App, point the camera to the paper city map and visualise the digital information within an AR environment and then, interact with and access to more data for each object (e.g. visualise ancient pictures of that object, read the text about its engineer/architect, or identify their position on map and the relation to the rest of the LAS structure). The case study of LAS was preferred, considering the especial feature that the remains of this important landmark are mostly underground and are not known by visitors or even by some inner residents. It is also relevant to verify that some parts of these underground galleries can be visited, having an enormous potential for tourism and consequently functioning as sources of income for its management entities. Nevertheless, the main research idea that outcomes from the development of this App was to increase the intrinsic value of this cultural heritage object; in this case, considering not only the individual elements of the aqueduct, but also the wider delimitation of the entire system (over years of constant construction), identifying the most relevant path and associated elements, starting from several springs, subsidiaries and distribution aqueducts and galleries, vents, connections with the exterior and culminating in the fountains, spread throughout some of the most relevant and growing locations within the city (18th to 20th centuries). 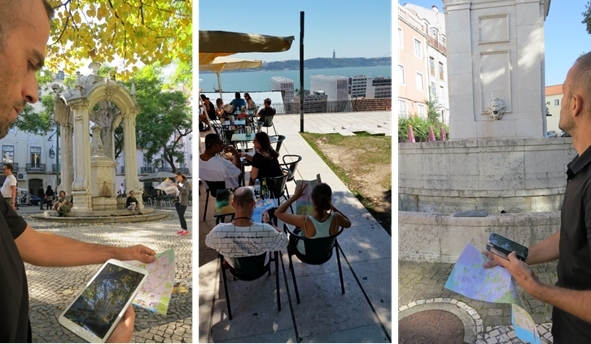 Most of these places are within the most touristic and visited areas of Lisbon, which could not be detached from cultural heritage knowledge and dissemination, considering the potential interest of a tourist to discover the city. The buildings with heritage value, as is the case of the Lisbon Aqueduct System (Águas Livres), are part of the city as outstanding elements of the urban space. Often, these elements are so iconic that they form a relevant part of the city identification itself (as is the case of the Colosseum in Rome, the Eiffel Tower in Paris, the Cathedral of the Sagrada Familia in Barcelona, the Tower Bridge in London, just to name a few examples). These cultural heritage elements have a substantial power of attraction, particularly for tourists. Tourists somehow endorse these “attractions” since they are systematically preferred for their visits, as circular causality. It is the unique value of this heritage with “global influence” to shape the image of the cities. Technology has always been at the service of promoting and enhancing heritage. Photography, for example, is one of the technologies that has most contributed to record what we might call “memory extension”, i.e., it has been used throughout the ages as a means to record moments of a tourist visit, to remember later (this is what we refer to as “extension of memory”); sharing with other the experience they have lived. Augmented Reality is an enriched view of the physical world that empowers users to experience virtual data superimposed on real environments that function interactively in three or four dimensions (3D+time) in real time. The emergence of mobile devices such as smartphones anticipated a huge potential field request for Augmented Reality applications. When appropriately conducted, the application of three or four dimensional Digital Representations of Cultural Heritage superimposed on the real world, within an Augmented Reality environment, using mobile platforms has the power to improve temporal understanding, map the uncertain, verify the limitations of human perceptual reasoning, and create systems to form collaborative solutions, envisioning processes, simulations, and results. These external affordances enhance human cognition and help to understand societal and anthropologic behaviour besides their symbolism, considering the bases of cultural and heritage conceptions. This is highly relevant for human knowledge, enhancing and augmenting the intrinsic value of the object in analysis. The value attributed to Cultural Heritage might be increased by the use of digital representations, which disclose, explain and promote its symbolic significance, technical-scientific importance, unicity, or other relevant assets, disclosing what could be considered as an Augmented Valuation of Cultural Heritage. The concept of Augmented Valuation of Cultural Heritage (Marques, 2017) is clearly inspired by the concept of Augmented Reality, being capable of identifying, analysing, and increasing/augmenting the intrinsic value that is already present in the notion of cultural heritage. This concept brings about the opportunity to recognize that, besides the idea of enriching the physical environment with virtual synthetized data, Augmented Reality technology can simultaneously increase the intrinsic value of cultural heritage. This concept presupposes the process of augmenting the value of cultural heritage. This valuation is dynamic since the user experience mixed reality environments as the process of dynamically augmenting cultural heritage valuation. We would like to express our deepest gratitude to: Teresa Romão, Fernando Birra and Antero Pires from the NOVA Laboratory for Computer Science and Informatics (NOVA LINCS), unit of the national Science & Technology network in the area of Computer Science and Engineering, hosted at the Departamento de Informática of Faculdade de Ciências e Tecnologia of Universidade NOVA de Lisboa – Portugal (DI-NOVA), for the conception and implementation of the App. 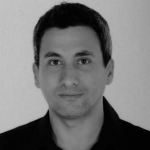 To the startup company GEODRONE and its founder João Marques for the UAV survey. To Josep Roca from UPC – BarcelonaTECH and CPSV for suggestions and critics. Geographer, Associate Professor at Universidade NOVA de Lisboa (UNL), Faculty of Social Sciences and Humanities (FCSH) and Researcher at CICS.NOVA - Interdisciplinary Centre of Social Sciences, RG4, Lisbon, Portugal. He is a Visiting Professor at Polytechnic University of Catalonia, BarcelonaTech (UPC), Faculty of Architecture, CPSV, Spain. He was Director of Centre for Geographical and Regional Planning Studies (e-GEO, FCSH, UNL), between 2003 and 2008, member of the Executive Committee of the Department of Geography and Regional Planning of FCSH-UNL (2008-2013), Director of M.Sc. in Territorial Management at UNL-FCSH (2008-2013) and Director of M.Sc. in Spatial Planning & GIS (e-Learning) at UNL-FCSH (2010-2013). Graduated in Geography and Regional Planning (1984) at UNL-FCSH. 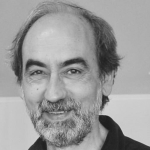 He attended Sorbonne-Universités, University of Paris VI-Pierre et Marie Curie, Faculty of Sciences, where he post-graduate (DESS in 1991) in Remote Sensing and the University of Paris XII, Urbanism Institute, to obtained Ph.D. (1998) in Urbanism. His main scientific area of research is Remote Sensing, GIS, Spatial Analysis, and Geographical Modeling. He has published more than one hundred papers (book chapters, papers in periodic with scientific refereeing, papers in conference proceedings with scientific refereeing). In 2013 he received the (first prize) SANTANDER Award for the Internationalization of the FCSH Scientific Production 2013. In 2015, for the second time, he received the (first prize) SANTANDER Award for the Internationalization of the FCSH Scientific Production 2015 (ex aequo). PhD (2017) in Urban and Architectonic Management and Valuations at Barcelona School of Architecture of the Polytechnic University of Catalonia – BarcelonaTech (ETSAB/UPC). Master (pre-Bologna, 2010) and Post-Graduate (pre-Bologna, 2002) in “Land Use Management and Environmental Planning” at the Faculty of Science and Technology of the New University of Lisbon (FCT/UNL), Portugal. Degree (pre-Bologna – four years) in Geography and Regional Planning at the Faculty of Human and Social Sciences of the New University of Lisbon (FCSH/UNL), Portugal (1997-2001). Senior technician at IGAMAOT – General Inspection for Agriculture, Sea, Environment and Spatial Planning (Portugal). Has been collaborating with several organizations of the public administration (at central, regional and local level) and private companies, mainly in research projects related to the themes of spatial planning and environment (commonly with the use of Geographic Information Technologies).